I went to a fascinating demo by Cherry Nichol at the Constantia Art Society monthly meeting. She uses watercolours but adds splotches of a medium called ATP Clear. This absorbs the watercolour and you can move it around like oils. It dries leaving a texture. She also uses pastels in the wet watercolour for highlighting stems etc, and Progresso Aquarell woodless coloured sticks which she sanded into the watercolour. This created little flecks which partially disolved. I have decided that this is the year of workshops and Plein Air painting!!! Cherry Nichol will be holding a workshop which I definitely want to attend. I am not yet confident enough to use oils outdoors and so have been using charcoal and water. The sketch below was done in this medium. I then took some very old fat crayons that my daughter was given when she was a child to paint on faces. Using these I started adding a bit of colour. The sketches above were done at Kirstenbosch and are very rough. I then bought myself some of the woodless coloured sticks that Cherry Nichol uses. They are magic! 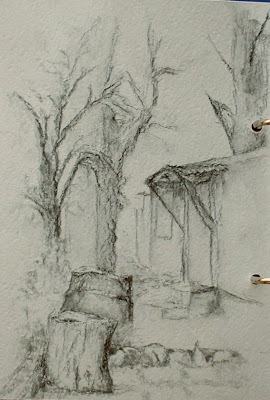 The following sketches were done at the Montebello Centre while sitting at the exhibition. Lots of practice is now needed! I love all the experimentation! Isn't it great when you are inspired at a demo. Good luck with the Plein Air painting! I'm so glad you posted these - I love the way you've done that old chair! Well done. Hi Dianne thanks for the visit. Inspiration is what it is all about isn't it! A friend is busy becoming a teacher of Intuative art -that is one workshop I would love to do, and probably need to do! They start with meditation and then work with the right side of the brain - must be amazing. She says it is mind blowing. Thanks Liz. Wish I could have taken it home with me! Carolann, thanks for the visit. I am not usually an experimentor but am learning with much delight! Montebello is the most devine place to paint and I hope to be spending many hapy hours there in the dappled sunlight with the squirrels playing in the trees up above! I think it is one of Cape Town's best kept secrets.